We went to Atlantic City, New Jersey, a few weeks ago. We had never been there before, and we got a great deal on a hotel, so off we went. Armed with a full tank of gas and our Google Maps, we were on our way. It is not as though we needed the maps. Pretty much every major city on the Eastern Seaboard is within spitting distance of I-95. All you have to do is get on the freeway and go north or south until you reach your destination. But Fluffy is an organized soul, and he thoughtfully placed the map above my visor so it would be handy as we drove. But a curious thing happened. After went through Maryland, waved at Philadelphia, and said hi to Delaware, we saw a sign that told us to turn right for Atlantic City. This was not what Google Maps told us to do. Google Maps wanted us to continue on the toll road all the way through New Jersey. We had already paid four dollars and then eight dollars in tolls, all within a ten-minute time frame. Google Maps wanted us to continue to pay tolls until we had reached our destination. As the toll-payer in the family, I was not exactly thrilled with this proposition. So when we saw the arrow telling us to turn off onto State Road 40 in New Jersey, I asked Fluffy what he thought of the idea. He thought it was a good one. We immediately knew we had made the right decision when we saw a gorgeous stand of fruits and vegetables, right inside the New Jersey state line. I wanted to stop and buy the produce. Fluffy wanted to stop and take pictures of the produce. We vowed to stop there on our way back. Then we hit upon a puzzling sight. For about ten miles, everything we saw was “wild west” this and “cowboy” that. There is a certain part of New Jersey that has a serious identity crisis, even to having places where you can buy your cowboy boots and other clothing essentials, and locations where you can attend your weekly rodeos. Who knew that New Jersey had a secret cowboy fixation? Yee-haw. 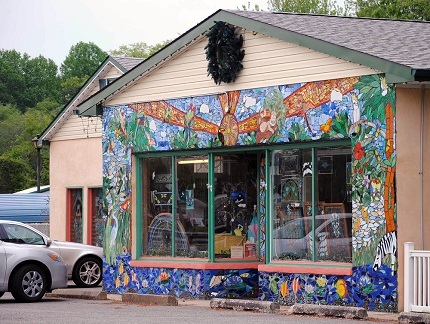 When we got to Elmer, New Jersey, there was a whole building whose façade was made of stained glass. It must have been especially interesting at night, because it was topped by a wreath and Christmas lights. Next we saw an old Texaco station, right in the middle of nowhere. 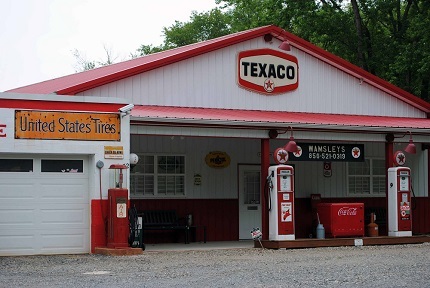 It was just as you would have seen a Texaco station back in the 1930s, I guess (and I’m guessing because no, I was not around in the 1930s). There was not a person on the premises. Nobody was taking tickets. 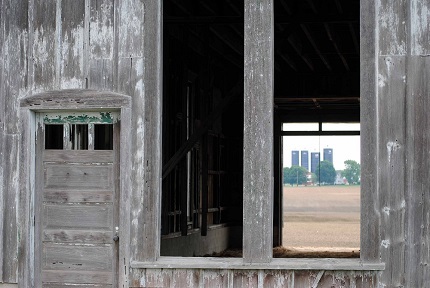 It was just there for people to look at who might possibly be interested in a relic of days gone past. 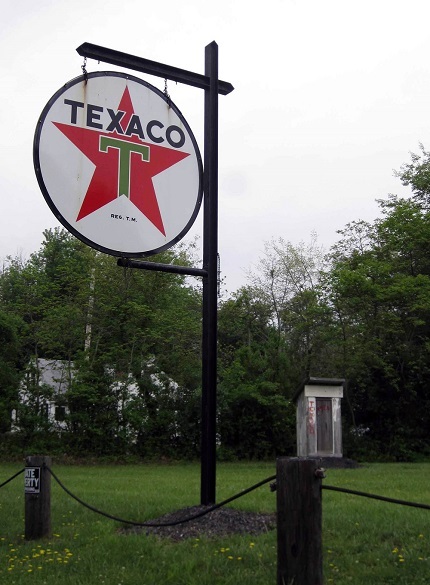 The Texaco station came complete with its own vintage outhouse. Somewhere along the road we saw a building that used to be something interesting, but that was on its last legs. Fluffy could spend all day taking pictures of a building that is about to fall down. It took great self-restraint for him to spend five minutes at this ramshackle structure before we continued our journey. We passed a home where the owner had dedicated his life to whirligigs. There were hundreds of them — maybe thousands. Unlike the person who recreated the Texaco station, the whirligig man was open for business. He was no doubt disappointed that Fluffy only wanted to take pictures of a few of his hand-created masterpieces. 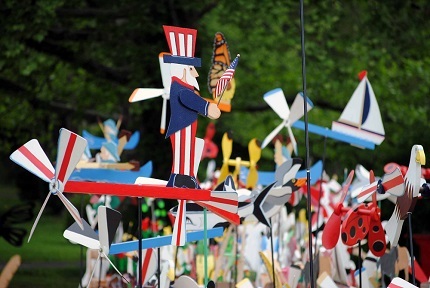 Only a few of thousands of whirligigs we did not purchase. 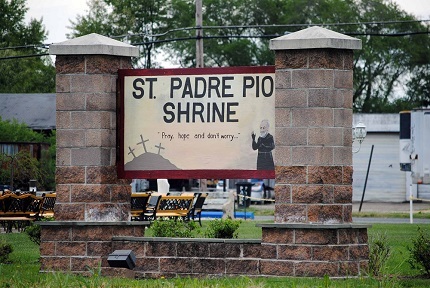 Being card-carrying Mormons, we had never heard of Saint Padre Pio, a 20th Century Italian Catholic saint. But there is a shrine to him on Route 40, and there is actually one of his gloves as a relic at the shrine. There are benches where worshippers can pray at the shrine, and we saw several people worshipping at the altar when we were on our return trip. You don’t see things like this on the Interstate. Not only did we see signs advertising lambs and sheep and pigs and goats for sale, but we also saw a sign that advertised alpacas that were available for purchase. Fluffy said we were driving down a full-service livestock alley. We kept noticing that people were lined up to pass us, even though we were going ten miles over the speed limit. Occasionally Fluffy would find a place to pull over, and impatient motorists, all of them younger than we are, would pass us in disgust. Undoubtedly all of them gave us dirty looks when they passed. We realized that we have become exactly the kind of old people we used to pass on the road with those same looks of disgust. When did this happen? When did we stop being those young, impatient people who were always in a hurry to get places and start being the old people who are more interested in the journey than the destination? Frankly, I like the stage of life we are in now, better. As we neared Atlantic City, we saw a rental storage facility unlike any rental storage facility we had ever seen. This one was decked out to represent a small town, complete with people and a car dealership. There was even a truck with a piano roped onto the bed of the truck. It was amazingly creative. 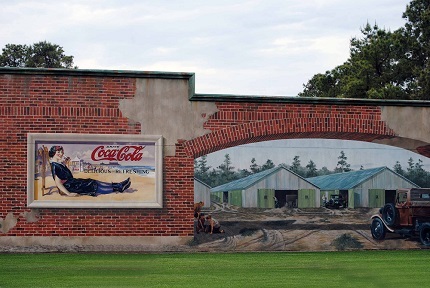 This fascinating scene disguises a pedestrian storage facility. A real Model T was parked outside the facility near here. If you tried driving into this muddy parking area, you’d hit a brick wall. Even the sharp keys on this piano are flat. 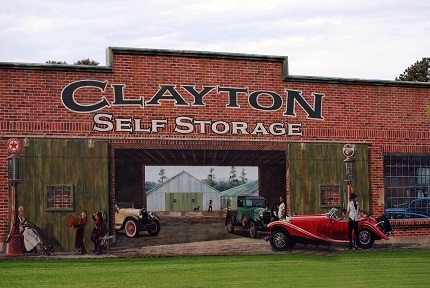 When we first saw the storage facility, there was a mint green Model T in perfect condition, sitting out front just as it would have been if it had been part of the tableau. 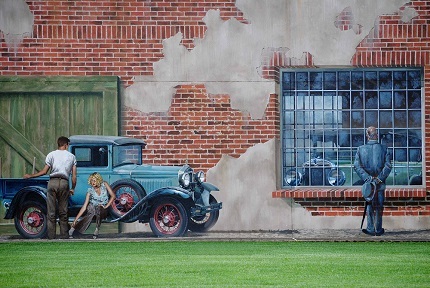 When we drove back to take pictures of the scene, it was out for a spin so we missed it. It was a thing of beauty. Our road merged into the road where Google Maps would have taken us shortly after we passed the storage facility. We only saw one other curiosity, but it was a doozy. 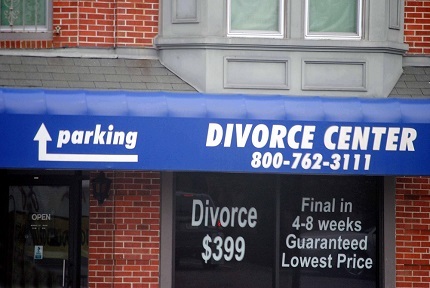 It was a drive-in divorce facility. You plunk down your money, and four to eight weeks later you are rid of a pesky husband or wife. I have had warts that have taken longer than that to get rid of. For only $399 you can get rid of a slothful husband or a nagging wife. Such a bargain! Eventually we reached our destination. 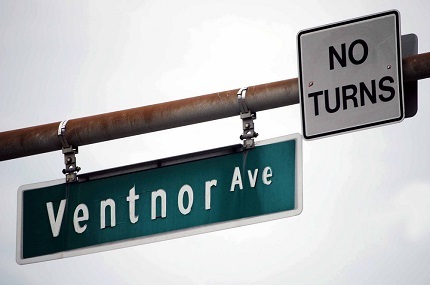 When we saw Ventnor Avenue, we realized we were in the city that inspired the Monopoly board. We had not passed GO. We had not paid $200 in tolls on the toll road. We had done it all without Google Maps, and we were happier for having done so. Although we reached Ventnor Avenue, we did not pass GO, and we did not pay $200 in tolls on the toll road. It’s always good to have a map when you start on a journey. Many people get hopelessly lost when they go on a trip without having a map to guide them to their final destination. It’s good to be organized when we go through our lives as well. But sometimes we enjoy that journey even more when we take a detour and get off the beaten path — when we travel just for the sake of appreciating the wonderful world that God and the delightful people He has made have created for the enjoyment of others. It amazes me how often we think we have our lives planned, and God sends us off on a different direction entirely. When God takes the Google Maps of our lives and throws them out the window, sit back and enjoy the ride. He always knows exactly what He is doing.